So why builders plates I hear you ask ? Well this is how I got into this exciting hobby. It all started in my younger days on Saturday mornings with my grand father at a local scrap yard where he would meet his friends (who used to cut up used railway equipment for a living) and I could climb over the old steam engines (well at eight years old, I could not think of any thing more exciting to do). After a couple of visits one of my grandfathers friends asked if I would like a builders plate. A builders plate I asked ? Well he said gruffly. Which one do you want ? As two absolutely massive hulks stood before me. I pointed and said that one, still not knowing what a builders plate was. Then a burst of sparks and a loud thud. Well there it is, but give it a chance to cool. Cool it did and we took it home. My grandfather said on the way home you are going to like this !! First thing on arriving home we placed the builders plate straight in the wash basin where it was given a good scrub so the years of soot and ingrained dirt started to wash off the brass plate and it started to shine. WOW it came to life !!!!! I grabbed a dish cloth (white of course) and started rubbing, the more I rubbed the brighter it shone. It was like winning the lottery, until my Grandmother went absolutely nuts on my Grandfather for being so irresponsible for using her new dish clothes on old piece of brass. Today I still chuckle about just how funny it was, but then we ran for our lives my grandfather included. More visits and more plates, a box of old rags (provided by my grandmother) and a collection was started. As time went on I found that not all locomotives were the same. Some where big and some small. The builders plates also differed. Some were round, some oblong and some that looked like diamonds. I didn't care they just looked good and they were from Monster's languishing in the scrap yard. The years past and I came to learn that each shape represented a builder. Baldwin's were round, Alco were oblong and Lima's were the diamonds. Each plate had a story to tell, but what did they say ? Well like a birth certificate is to a human a builders plate serves the same purpose to a locomotive. 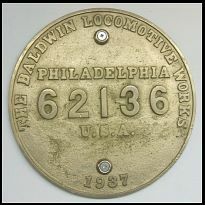 The plate tells the builders name, the construction number, the year of construction, and location of the builder. 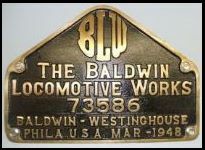 Some builders plates contain additional information such as the classification of the locomotive. They really told you every thing you needed to know about the locomotive. Fascinating. The wonderful thing about the builders plate hobby is that it brings people together from all walks of life from Firemen to Janitors, old and young a like. These are people who are not only passionate about railway's but people who enjoy history (i.e. when was the locomotive built) and geography (were did the locomotive run and which railroad or railroads did it belong to?). It's a very rewarding and interesting hobby. I have collected builders plates for a few years now and would be happy to here from any one with a similar interest. If you are having problems identifying a builders plate of your own please let me know I would be happy to identify it for you. My email address is caig@shaw.ca . I am also looking to add to my collection should any one have any surplus builders plates so please don't hesitate to send the details. Remember it's a great hobby to get into and I hope you enjoy the pictures.